Scroll down to see our selection of Transfer Benches for sale. Discount prices on a very large selection of transfer benches. Transfer benches are a safety item used in the bathroom in most cases. 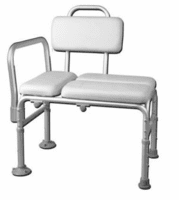 In the simplest terms transfer benches are used to allow a patient to slide from a wheelchair on a bench that sits half in and half out of the bath tub or shower. Most falls occour when stepping into or out of the tub or shower. By remaining seated on the transfer bench it is much safer for the user. Tranfer benches can be used in other instances when there is a danger of a fall. If you are looking for a transfer bench we carry many different brands and styles. Some of the specialty benches that we carry have a seat that slides on rollers reducing the friction for the user. We carry transfer benches that fold up for travel and some even have swiveling seats and toileting cut outs. Compare our prices and we are sure that you will do business here.